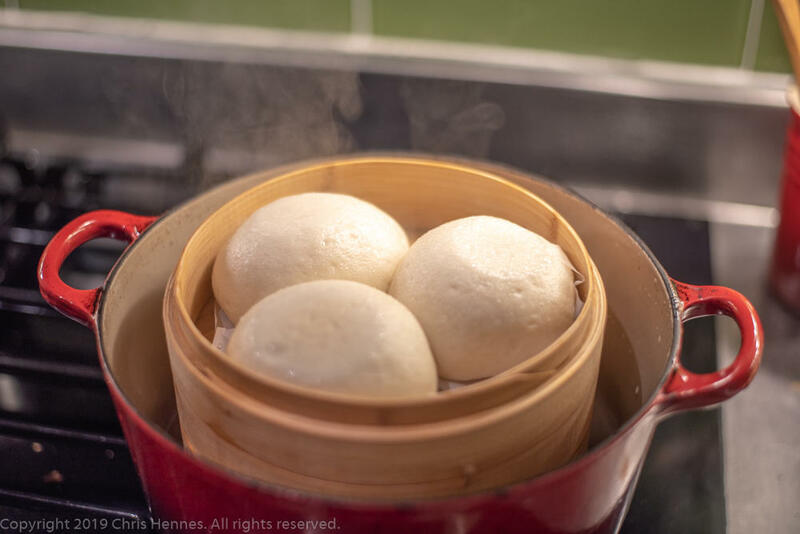 This is pretty typical recipe for steamed buns, although they go to great pains to point out that you can really steam pretty much any bread recipe. Of course you don't end up with a crisp crust, but sometimes that's desirable (I guess. Maybe.). 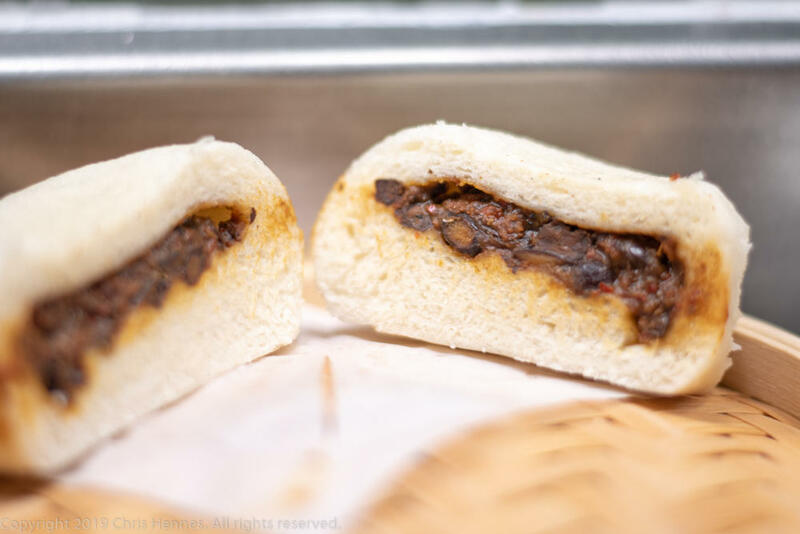 Filling these is optional, but I made a sort of Sichuan-esque filling with black beans, chili oil, Sichuan peppercorns, dark and light soy sauce, and shaoxing. Overall I was happy with them: I've never been to China so can't compare to the buns there, but they were certainly as good as any I've had in the US. Bonus points for being one of the few breads where eating them directly after baking doesn't brand you a barbarian. 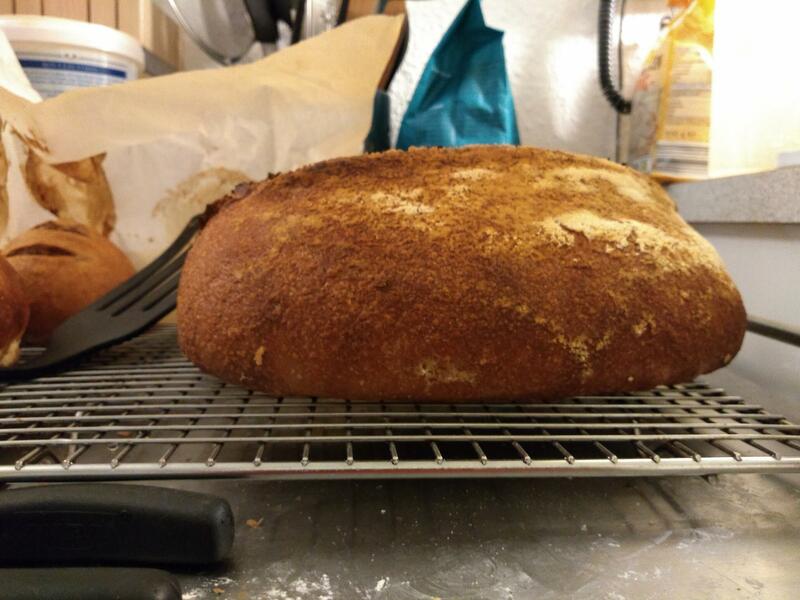 20% durum wheat flour, 10% each barley and quinoa flours, and the balance high-gluten bread flour. Inclusions are toasted flax seeds and sprouted brown rice. I've never thought to sprout rice before, and the book doesn't actually contain any instructions for that one. They have a long list of other grains to sprout, but despite a recipe calling for it, no info on sprouting rice. It turns out it's much slower than the other grains, or perhaps needs to be soaked longer. I actually started sprouting the rice the Tuesday before last, and it was just now ready as an inclusion this weekend. I soaked it for 12 hours and then followed the usual procedure of rinsing twice per day, but it took a long time to germinate. 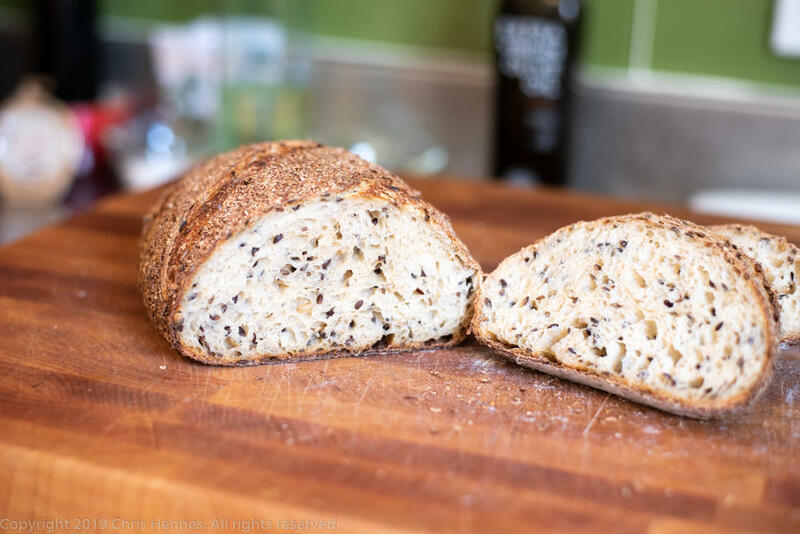 At any rate, it worked fine as an inclusion, but was overshadowed by the toasted flax seeds, both in terms of flavor and texture (not to mention appearance). Overall the bread is quite good, I'll probably make this combination again. Does anyone have any experience with the modified starch slurry for bagels? I have just tried it and I ended up wasting a large (and expensive) amount of sesame seeds because when I dipped the ultratex-coated bagel into the sesame seeds, it left small pools of the slurry. After dipping the first bagel, the bottom of the bowl became a sticky sesame-porridge and then they wouldn't adhere to anymore bagels I put in and would just slide off. Then the bagels ended up unevenly coated with big chunks of the gloopy sesame seeds which also didn't all dry out in the oven... My only thought was that maybe the ultratex needed more time to thicken. 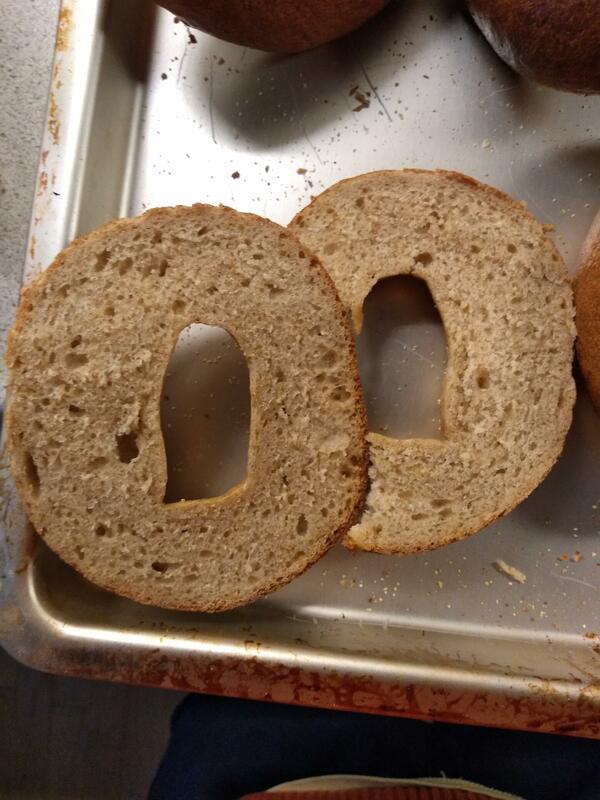 I left it for 2h but I wasn't sure what 'thick enough to cling to the surface of the bagels' meant. I will try again tonight after the ultratex sits during the day in the fridge and hopefully thickens some more. 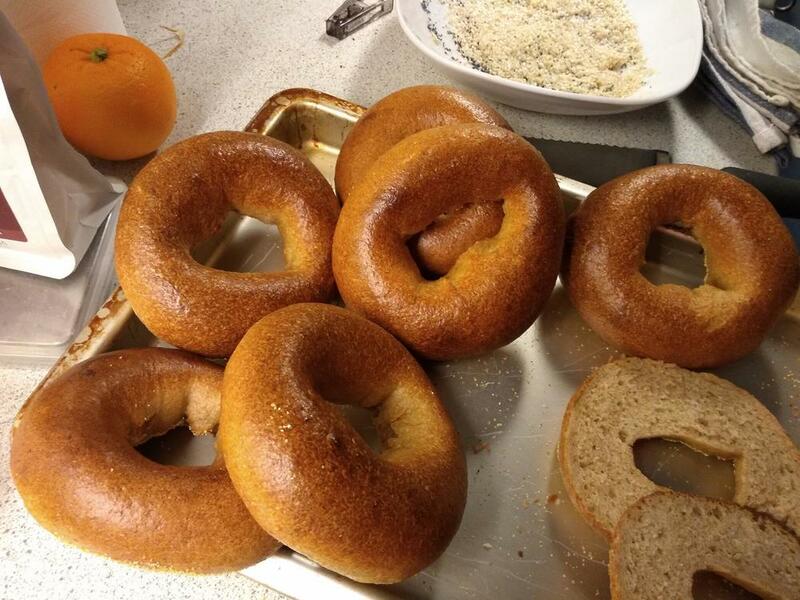 In less-frustrating news, I ran out of bread flour while I was weighing it (oops) so ended up using 30% wholegrain Spelt and 10% med rye with 1.4% vital wheat gluten and still ended up with uncompromised and delicious bagels! 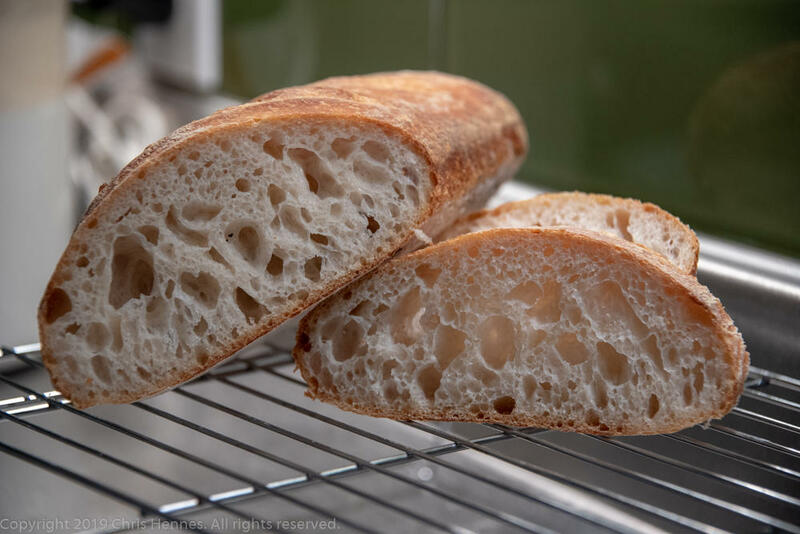 Does anyone have any experience with the modified starch slurry for bagels? I have just tried it and I ended up wasting a large (and expensive) amount of sesame seeds because when I dipped the ultratex-coated bagel into the sesame seeds, it left small pools of the slurry. It definitely hasn't seemed like the silver bullet they touted it to be but your bagels look amazing so it must be able to work! I will give your way a go tomorrow morning with some wheat bran (a little cheaper to waste!). Maybe I will also try putting some straight on the rack and sprinkling the topping over without dipping it. 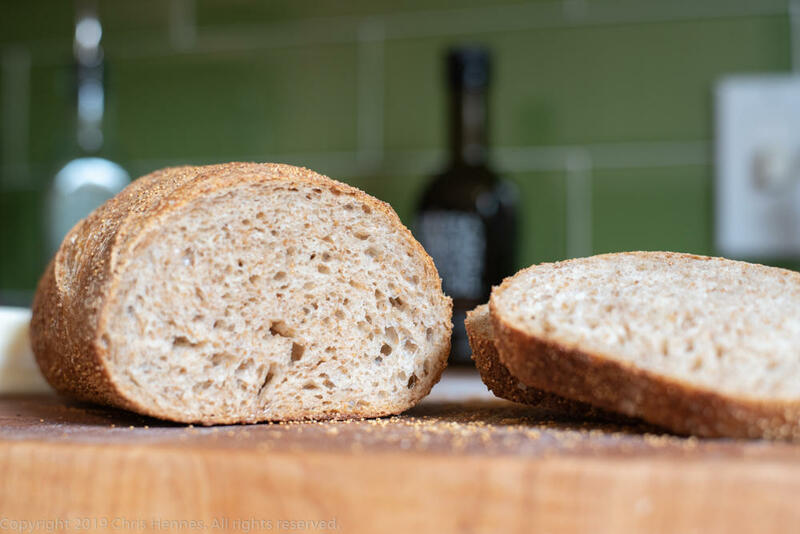 I just managed to procure some soy lecithin so my first thought was to attempt the Galliard loaf... Let's just say I've made many Neapolitan pizzas that were taller than this loaf. 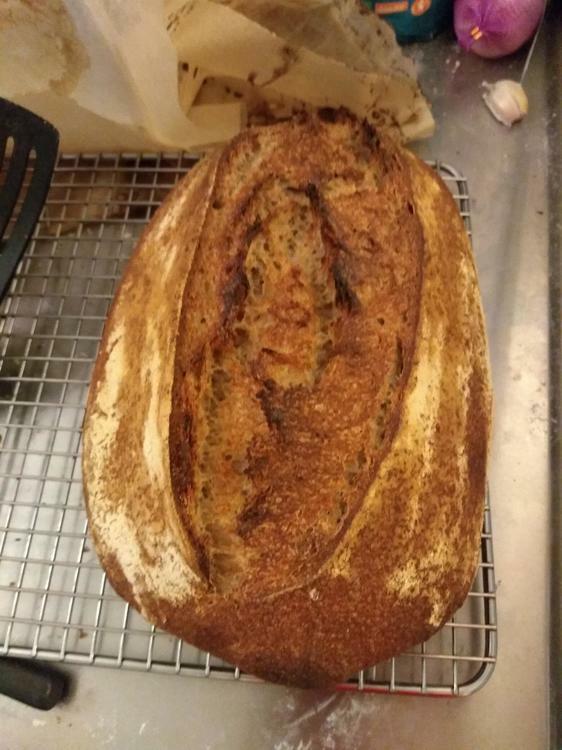 I will try it again, but use the recipe source's amount of sourdough to limit chance of the dough breaking down during bulk (MB used 5% more levain than Spiller) and Spiller's instructions to knead by hand only until smooth (rather than to full windowpane) and then shape immediately after that. 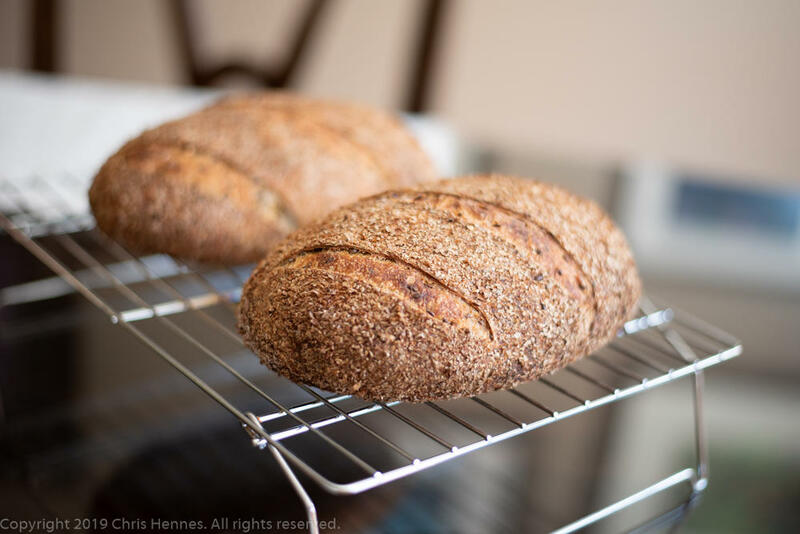 This is a dedicated recipe in the same spirit as the other "ancient grain" loaves, but with only buckwheat, and no inclusions. The recipe is a bit wonky: it's called 60% buckwheat in the recipe title, but you don't actually use 60% buckwheat, you use just under 50%. The "Net Contents" listing is all kinds of messed up, so I really don't know if it's the recipe that's wrong, or the title, or both. 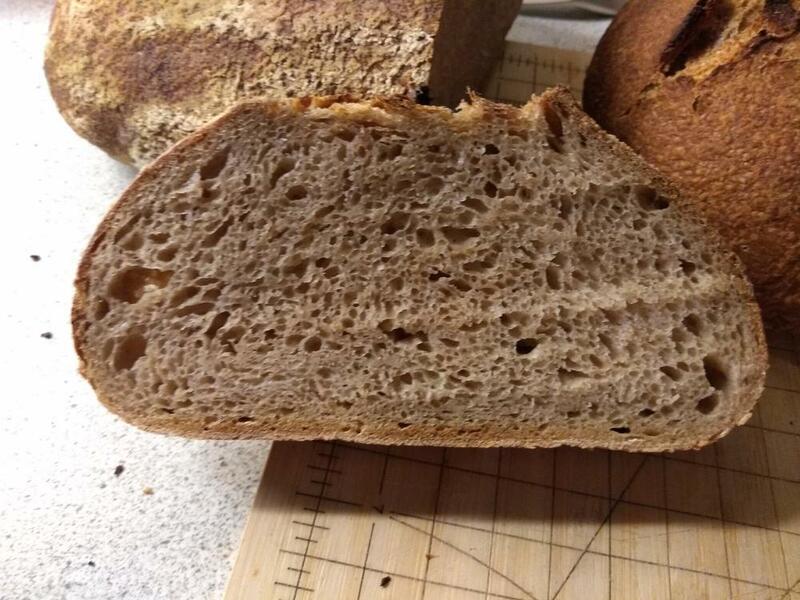 All that said, my loaf came out a bit on the dense side, with fairly minimal oven spring. 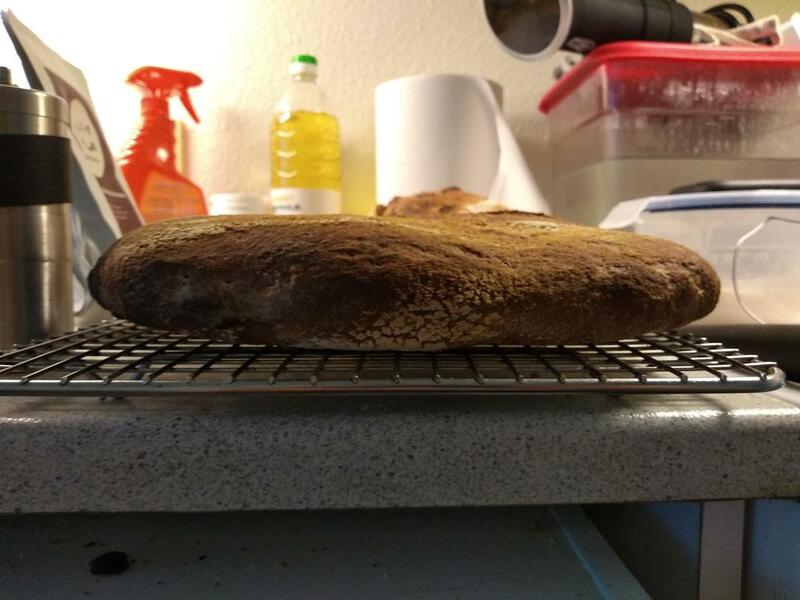 The dough was lower hydration than they normally call for, which may have accounted for part of it. The flavor is good, very buckwheat-y, but I don't have a lot of confidence that the recipe is actually the one they intended to publish. For their Modernist take on ancient grain breads they decided to go with a "second-chance sourdough"-style construction. I don't think there's any real reasoning behind it, they just thought it was nifty. 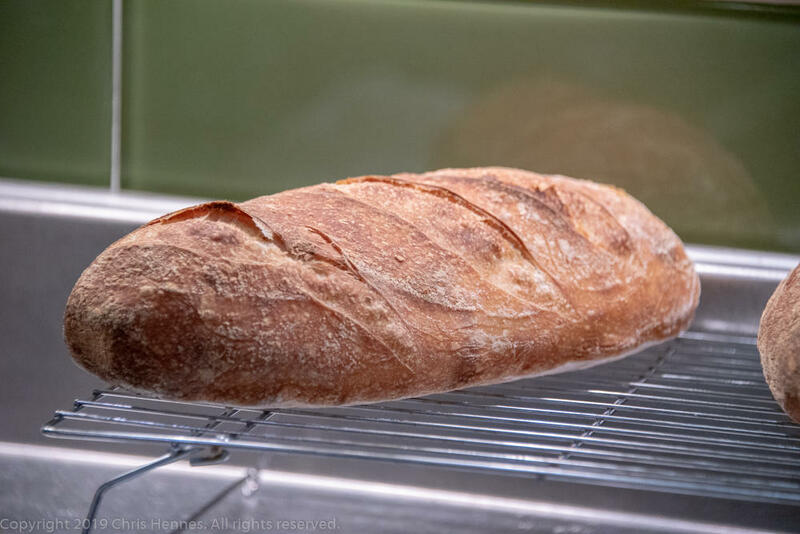 So it's really a French lean bread with an inactive levain inclusion at about 35%, plus a 48% ancient grain flour substitution, and an optional 7% sweetener. There's a lot going on there, so I kept it simple, just using spelt as a ancient grain and sorghum syrup as the sweetener, with no inclusions or complicated flour blends. 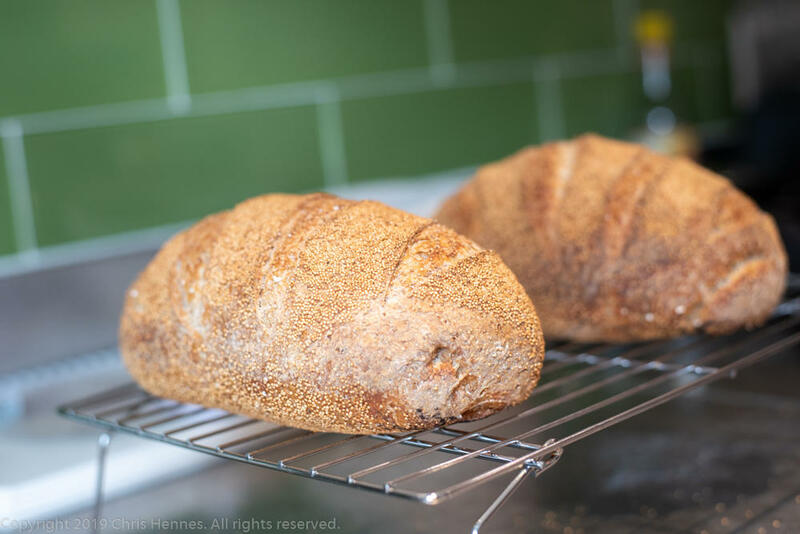 So far spelt is my favorite of these grains, and I enjoyed the slight sweetness from the sorghum syrup, so this bread was a success. 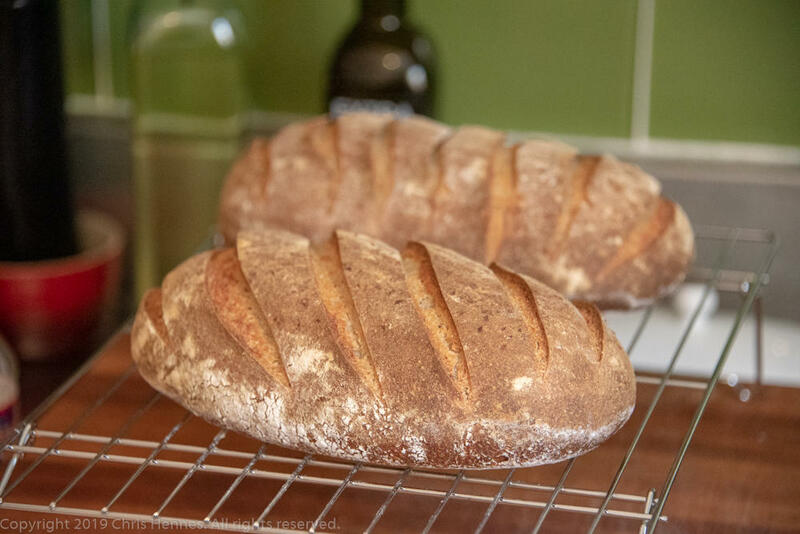 I think "in real life" I'd probably just make it as a straight sourdough, though, I don't often have a need for using up inactive levain. 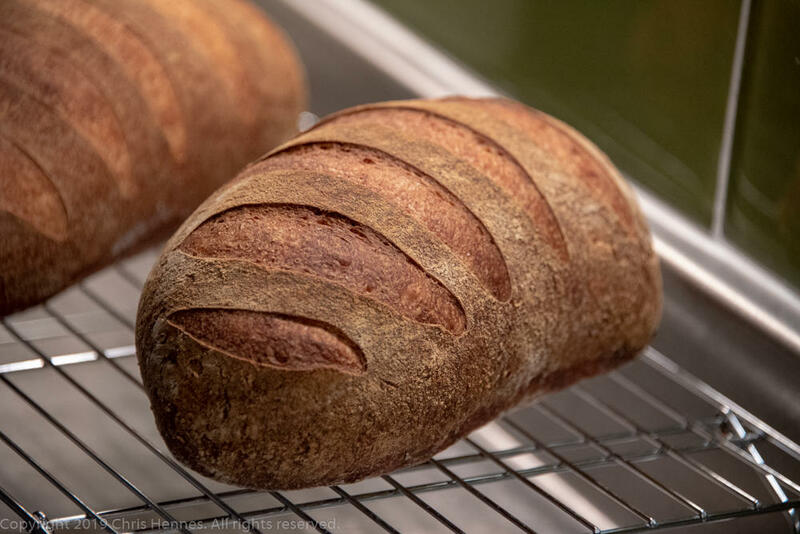 This is a very simple bread, leavened with a very large quantity of levain (66%), with a small amount of light rye added (17%). 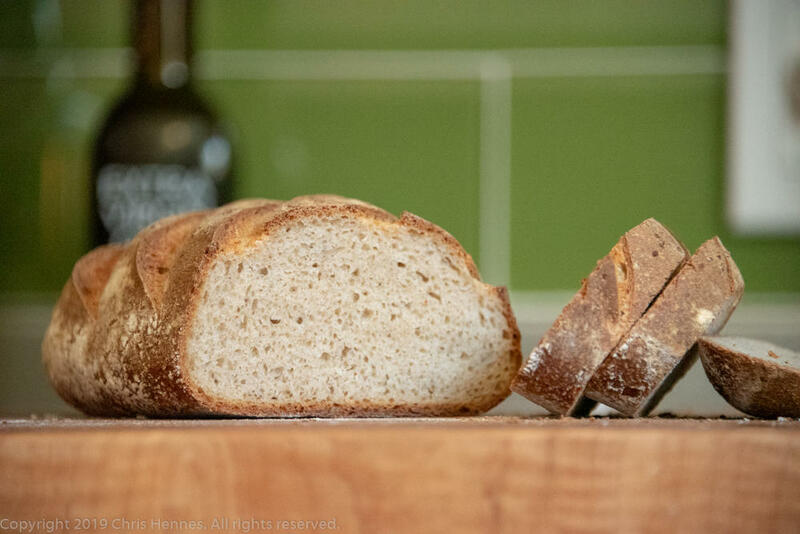 It's a high-hydration dough at nearly 80%, so it's a bit tricky to work with, but you get a really lovely open structure to the dough and the taste is terrific. Chris, what does "KM" mean? I use a slight variant on their sauce (just the quantities and ratios adjusted to use a whole can of tomatoes and a whole can of tomato paste). And as you can see I take the exact opposite tack when applying the mozzarella, not even adding it until the pizza is out of the oven. The residual heat melts it by the time it gets to the table, but it doesn't get warm enough to release all of the water that's in it. It doesn't work as well with a thin crust, but with a thick one like this it's perfect. 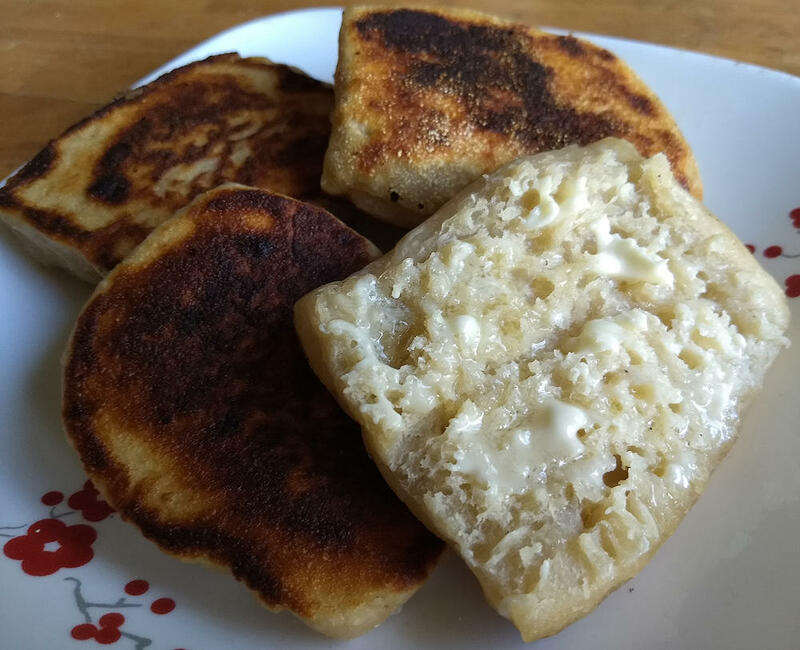 Modernist English Muffins, but modified to use only one initial addition of levain (and no other yeast). I've never made English muffins before so it's a learning experience. 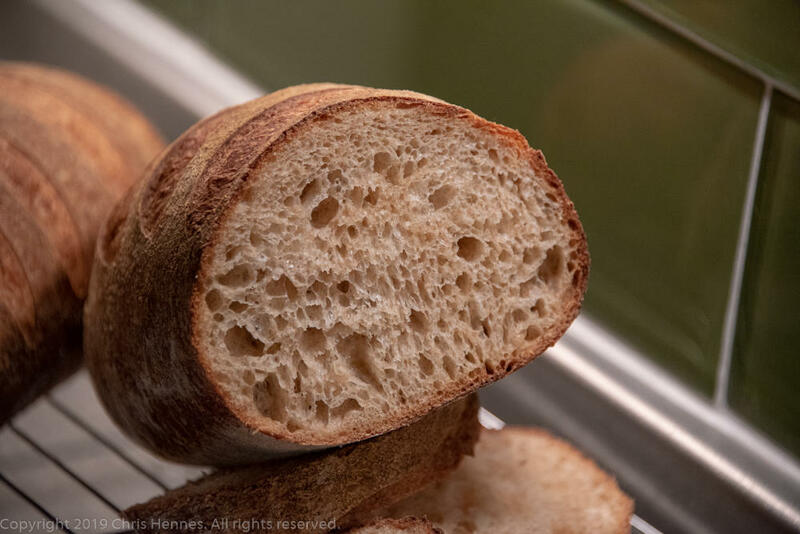 However, I do love love love brown crust, and EMs definitely have the edge over loaves of bread in terms of their crust/crumb ratio! 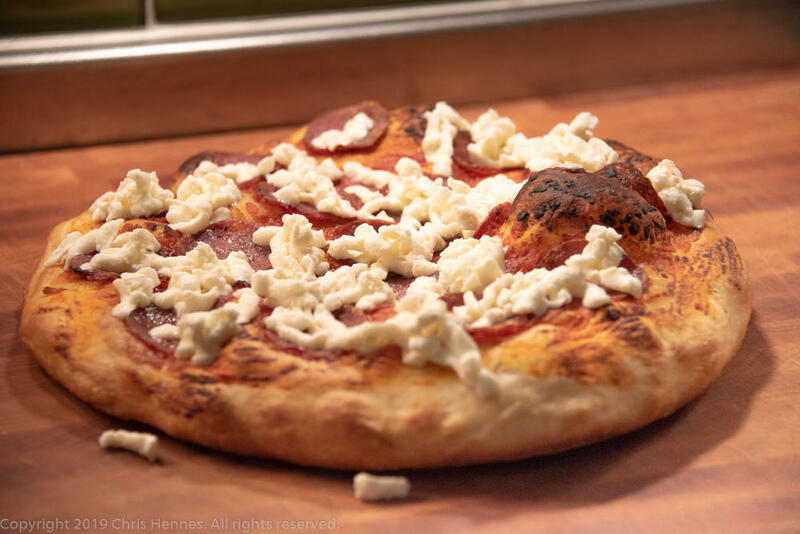 I proofed the dough for about 12 hours in the refrigerator, then put the container outdoors in the cool night air for another 10 or so to attempt to reproduce MB's 55°F target. It fluctuated from 57 to 53 and back to 60 before I brought it back in to divide and warm up. The crust flavor was excellent, but I'm still fiddling with the recipe.